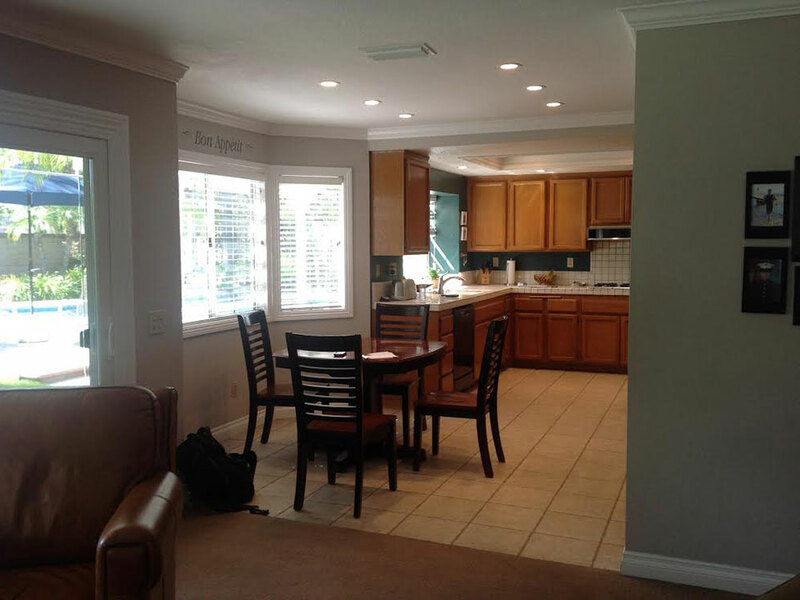 A homeowner in San Dimas recruited APlus to give their kitchen a serious upgrade, one that would modernize their home and improve its practicality. Prior to our renovation, the kitchen lacked efficient storage. 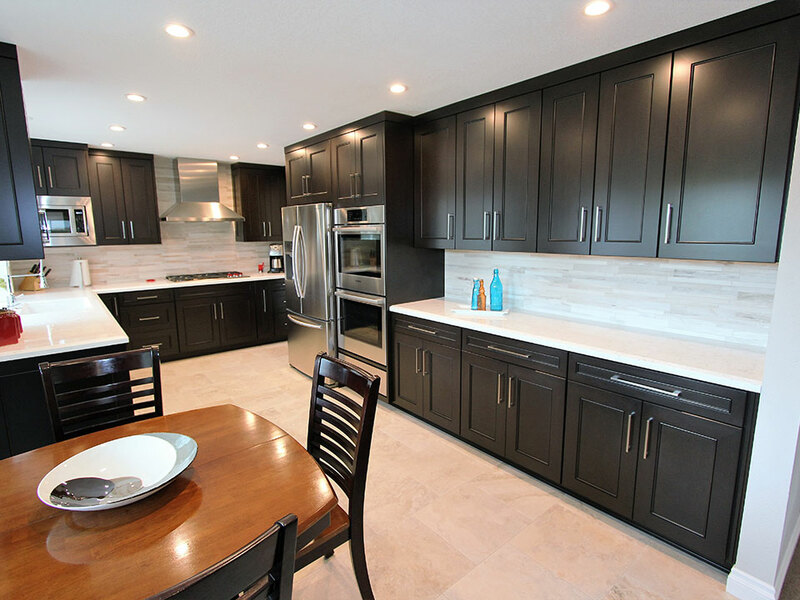 The cabinets were basic, without the specialized space-saving features that are built into all APlus custom cabinets. 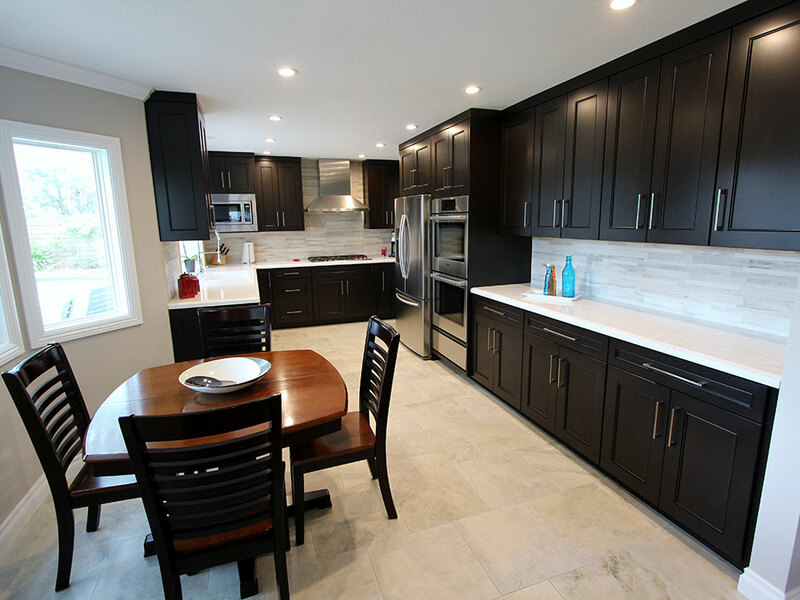 It was also missing a cohesive style that made it a pleasant, refreshing place for the family to spend their time. First, we re-paved the floors with pale white stone tiles, adding a very subtle geometric pattern and instant brightness to the room. The tiles reflect the light that spills in through the kitchen, as well as the illumination from the newly installed recessed lighting of the ceiling. We also added white crown, foot, and window molding in the dining space, as well as the living area that extends out from the kitchen. 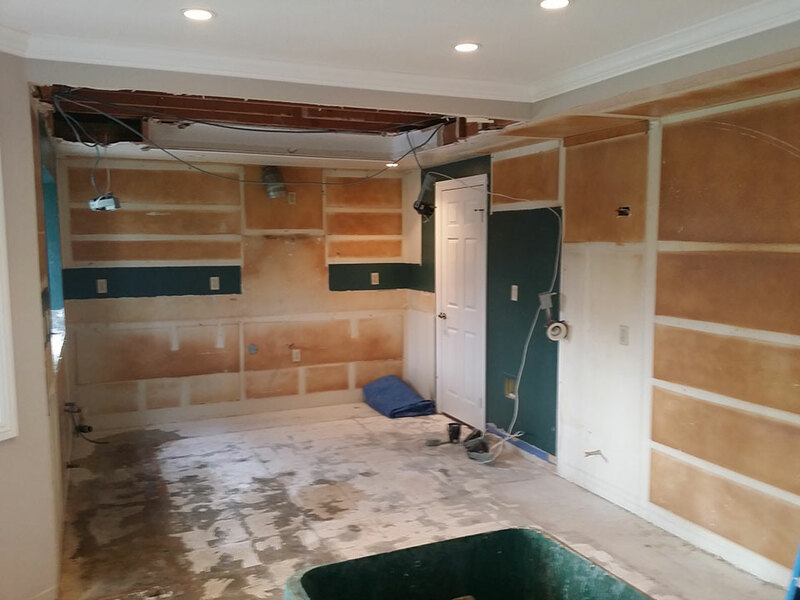 Once these foundational steps were complete, we moved on to building the new custom cabinets. The owner elected to go with an asymmetrical U-shape for the layout to make the most of the relatively narrow but long space. 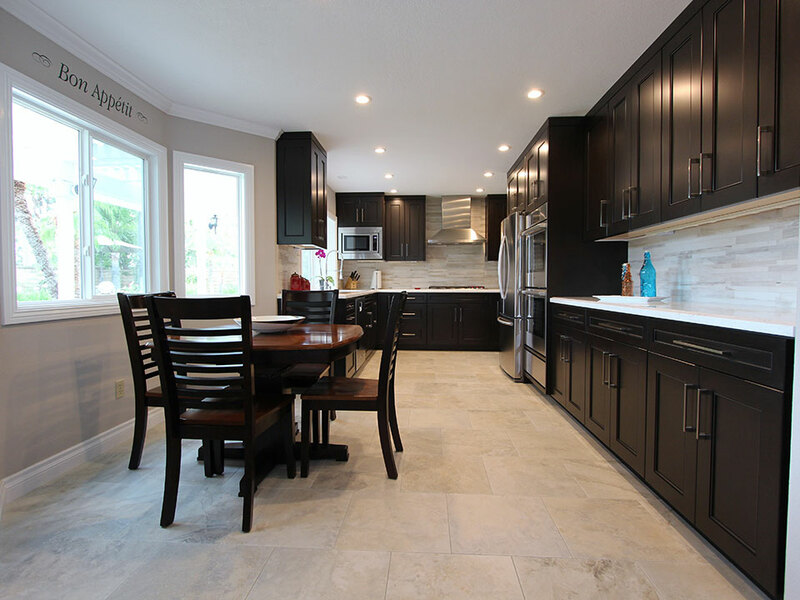 We built cabinets in a Euro style construction, with Jianas style molding, 3” Shaker style doors, and maple melamine interiors. They were given a Dark Manganese finish and contrasting stainless steel handles. All of the drawers are soft-close, and unique touches include a pull-out cutting board drawer. Built-in spaces were left for all of the appliances, giving the kitchen a perfectly tailored look. Beneath the upper cabinets were installed tracks for electrical outlets, removing the problem of unsightly plugs for countertop appliances. White stone countertops with very light gray marbling were chosen. This added to the kitchen’s new transitional look, and went well with the full-height backsplash of multi-tonal gray tiles, arranged horizontally for striking texture. All of the new appliances were selected in a stainless steel finish. A Kitchenaid Undercounter Dishwasher is on the left side of the kitchen, near the KitchenAid Architect Series II Countertop Microwave Oven, which was modified to rest within the upper cabinetry. A Wolf 36” Professional Gas Cooktop is paired with a Wolf 36” Cooktop Wall Ventilation Hood above. On the right side of the kitchen, a Samsung 22.5 cu. 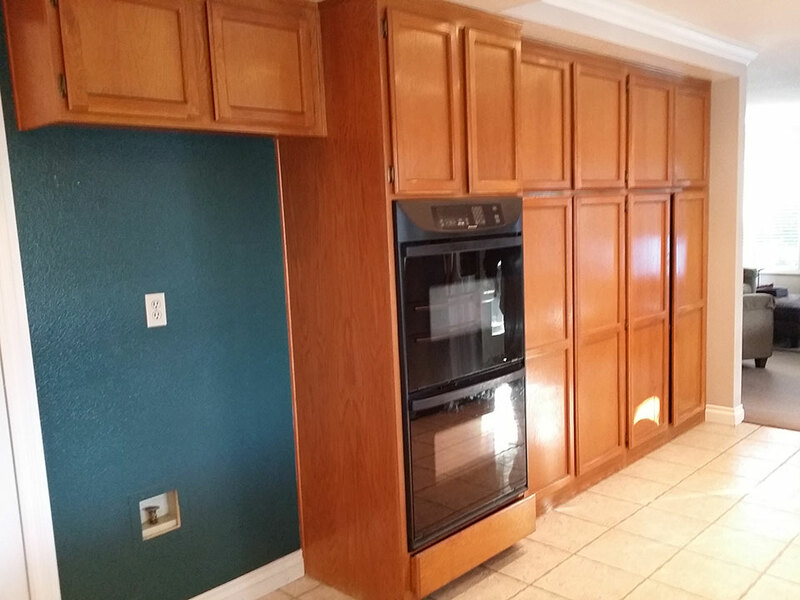 ft. Counter-Depth French Door Refrigerator with Cool Select Pantry is set next to a Bosch 30” Double Wall Oven. 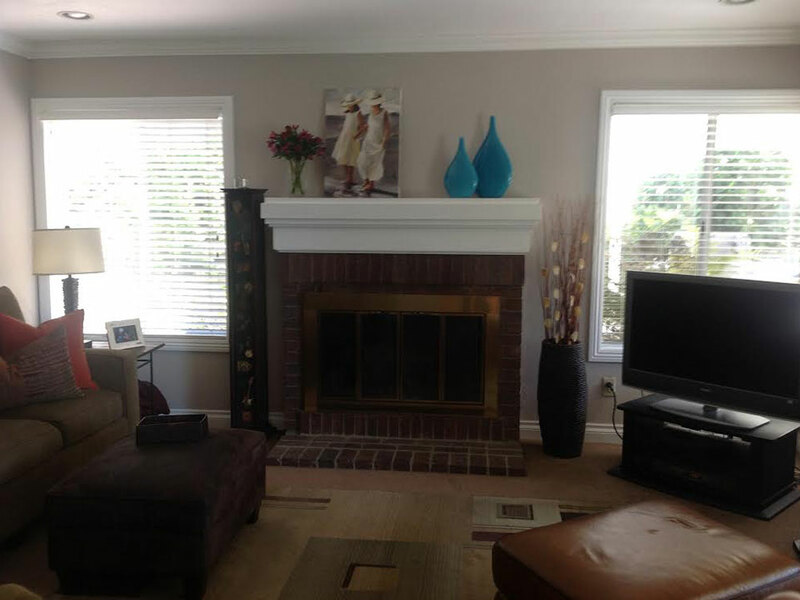 The fireplace was refaced in a minimalistic style, with stones similar to that of the kitchen’s floor tiles. 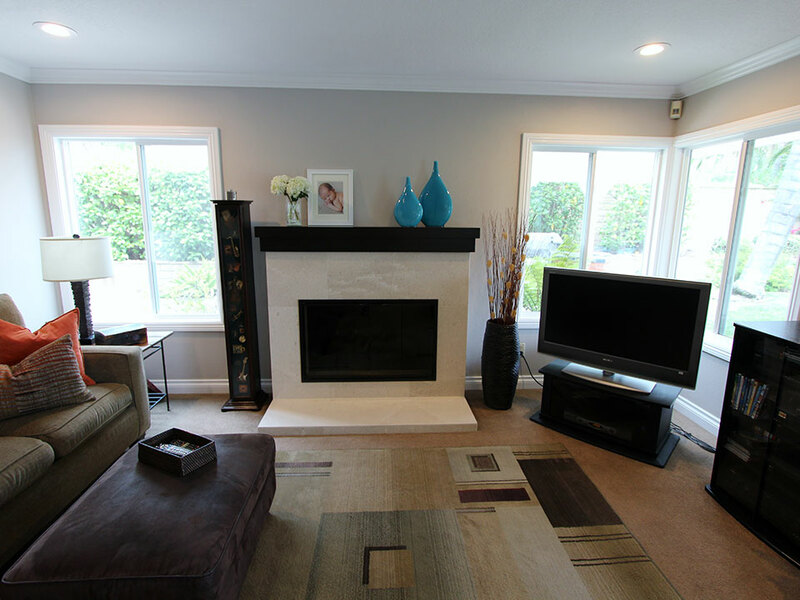 For the mantle, we went with a bold black design that provides plenty of shelf space for vases and family photos. 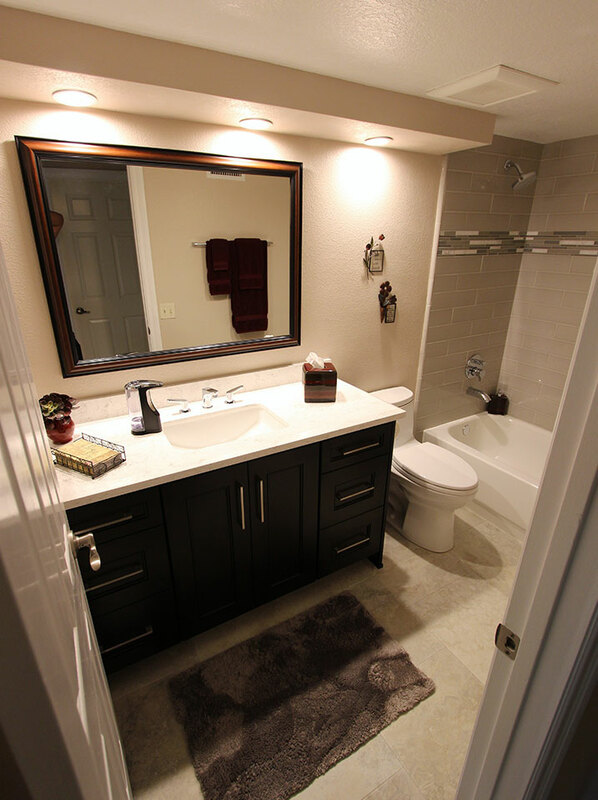 The same cabinetry and countertop materials were used in the bathroom to build a custom vanity. 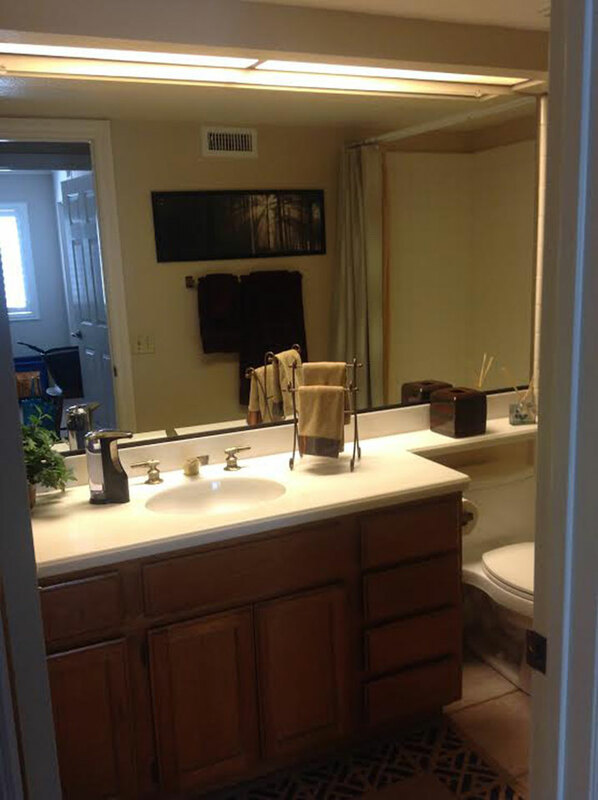 It’s equipped with a Toto undermount sink, and a Hansgrohe faucet. The shower’s tiling was also redone. We used glossy gray rectangular tiles as the primary surface, then created an accent stripe out of small multi-tonal tiles in varying lengths. 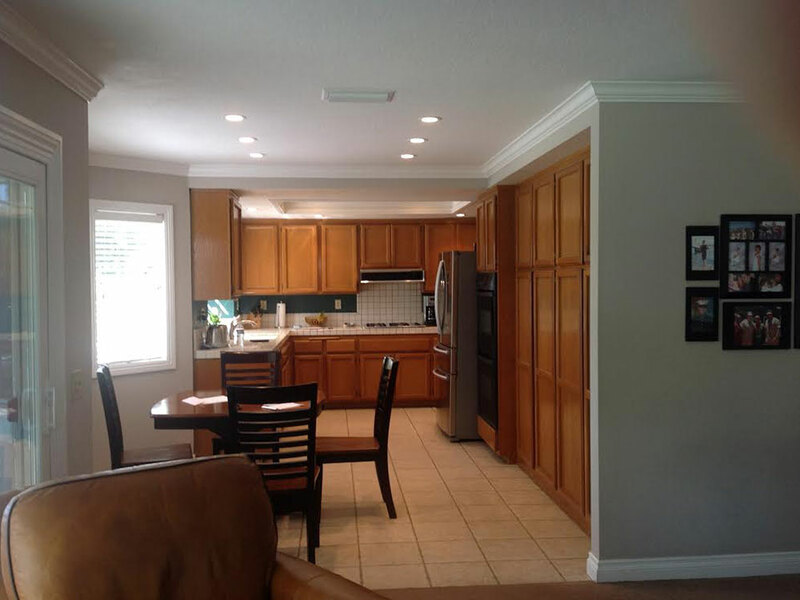 Are you interested in having your Orange County home’s kitchen or bathroom renovated? Get in touch with APlus today! 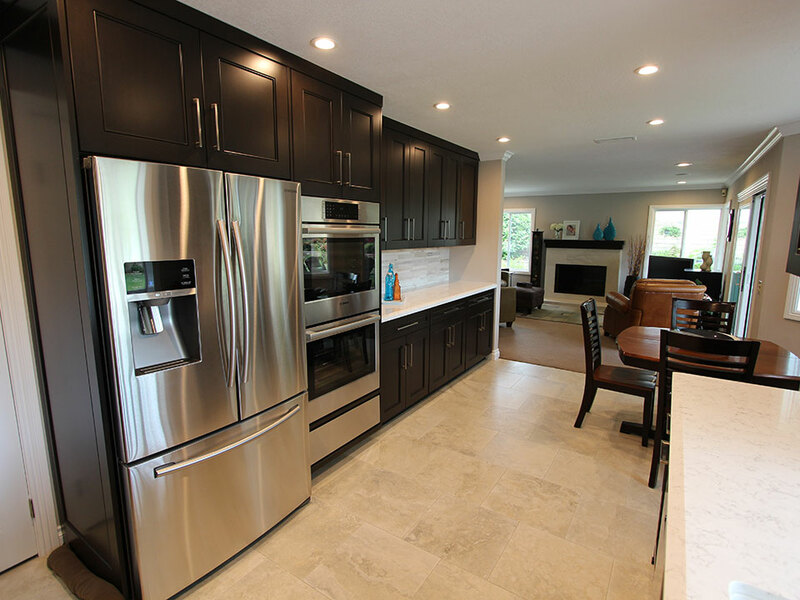 Our professional team performs all types of Kitchen & Home remodels.